A handful of common tiny soil-dwelling animals from Earth have successfully gone where previously only bacteria and lichens have been before by surviving a trip into low Earth orbit where they were exposed to the void of space. 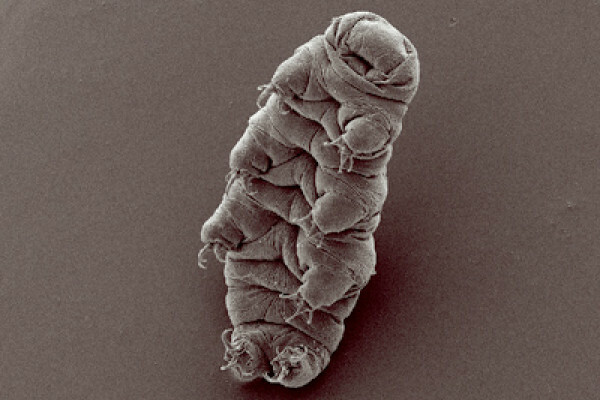 Known as tardigrades these animals are known to be very robust and can survive on Earth under extremely harsh conditions including almost total dessication but their ability to survive a space-walk like this is certainly a surprise. Ingemar Jonsson and her colleagues from Sweden and Germany sent both tardigrades and tardigrade eggs Heavenwards on a European Space Agency Mission last September. The samples were exposed to open space and varying doses of radiation ranging from just UVB and UVB to full solar radiation. Almost all of the animals survived vacuum exposure, two thirds survived the UVA and UVB exposure, and a few clung on even after a sizzling full solar radiation exposure. The researchers, who have published the work in Current Biology, are intrigued as to how these tiny animals are able to resist such fierce conditions. As such they may have previously unrecognised cellular mechanisms that shield them from injury and also enable them to rapidly and efficiently repair DNA damage. Understanding how they achieve this could hold the key to techniques for improved DNA repair in humans and possibly novel anti-cancer therapies.